Page Updated:- Monday, 26 November, 2018. Published in the South Kent Gazette, 9 July, 1980. Of ancient history, there is not much on the Sea Front, for the whole territory has been filched from Father Neptune and when the 20th Century dawned none of the residences around it boast an age of much more than 80 years. 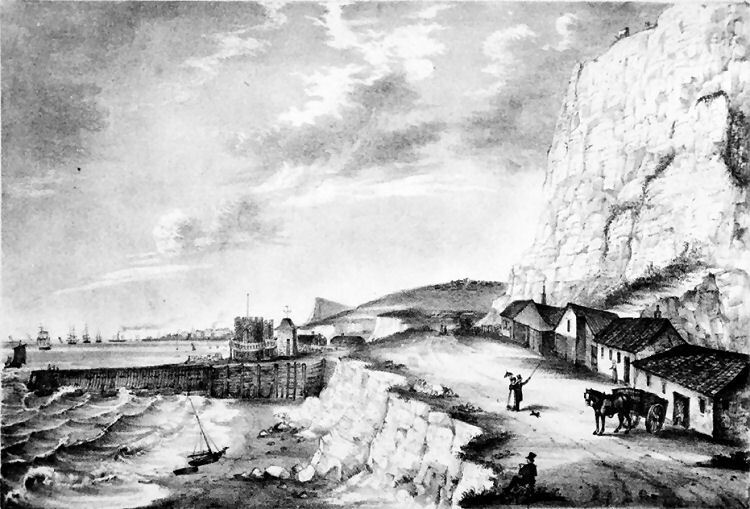 At the beginning of the 19th century, the entire margin of the Bay was unoccupied by habitations, with the exception of one solitary and peculiar dwelling under the Castle, partly hewn out of the solid chalk, but mainly consisting of a series of low buildings, curiously roofed with inverted boats, and having one part carried up to two stories surmounted by a turret. This was called Smith’s Folly, being built in 1791 by John Smith, father of Admiral Sir Sydney Smith who was notable in the Dover Patrol of those Napoleonic days. Although strange-looking externally, the interior was neatly fitted up, forming a pleasant summer residence. This snug little “box,“ now departed, was the parent fabric of all the present marine residences which encircle the Dover Bay. The site of the Sea Front was, prior to 1817, a ridge of shingle and ooze, which began to accumulate about the year 1500. This great shingle ridge was Dover’s original ropewalk, and the whole area was used, by the authority of an Act of Parliament as a gathering ground for the cobble stones, with which the Town Commissioners of 1778 paved the streets of Dover. View from Smith's Folley 1827 by Campion. The decision to utilise the wide margin of shingle around the Bay, as a building estate, was arrived at by the Harbour Commissioners, with the Earl of Liverpool in the chair, on the 9th of November, 1816. The Commissioners had before them, at that meeting, plans, drawn by Mir Horton, surveyor, of Buckland showing a street running parallel with Townwall Street, and nearer the sea, four blocks of houses with lawns between, the entire plan making provision for 96 marine residences. Mr Horton’s plans were somewhat modified, and the first part carried out was the landward side of the street in the rear, which was named Liverpool Street, in honour of the Lord Warden. The Sea Front houses were begun soon after. The Marine Parade was built and completed in 1820. Severely damaged during the Hitler war, along with much property between the Front and Castle Street, a great deal of the Sea Front property was subsequently demolished and replaced by The Gateway block of council-owned fiats. The houses on the Esplanade, at the western horn of the Bay were commenced in 1833; and Waterloo Crescent, the finest elevation of all, in 1834. Fortunately most of. these escaped the ravages of war. The fashion of sea bathing and spending a certain period of the year at the seaside, having set in lodgings were in great demand, and the whole of the houses round the Sea Front were soon completed. Colourful looking bathing machines, in the form of cabins mounted high on heavy waggon wheels often painted red in contrast to the white or cream cabins, were introduced on to the sea front before the end of the eighteenth century and two bathing establishments known as the Wellington Baths and the Royal Adelaide Baths were located in the centre of the Bay, between Waterloo Crescent and the Marine Parade. Bathing machines used at Dover did not need horses to pull them into the sea as was the case where there were long stretches of sand to be crossed before the sea was reached. The tenant of one establishment, the Wellington Baths, in 1839, was Mrs Ann Dudson, but, in 1840, it was sold to Mr James Brett, grocer, of King Street. The other establishment, was carried on by Mr Cullen Marsh, and he was in possession of the original bathing establishment in 1877, when the ground was cleared for the formation of the Granville Gardens. A new bathing establishment was founded at East Cliff, by Mr W J. Adcock, Mr Cullen Marsh being the first lessee. Dover’s marine baths, swimming baths, private bathing facilities and sea bathing were later taken into municipal control. The baths which adjoined the old sea plane sheds, next to Marine Court, were another victim of enemy action during the Hitler war. 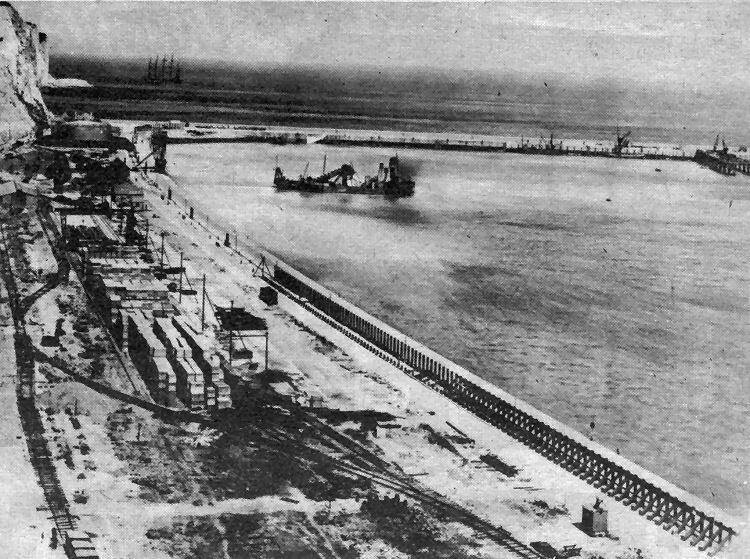 The Eastern Dock area as it appeared in 1911. No sign yet of any roads in the dockyard . . . and no thoughts for many years to come of a car ferry terminal. In the foreground a stockpile of concrete blocks used to construct the Eastern Arm and Breakwater, a dredger is at work clearing shingle and silt to accommodate big ships and outside the Eastern Arm is the ill-fated wreck of the five-masted sailing ship Preussen which ran aground in November 1910 and was so badly damaged she could not be salved. To the right of the picture work Is just' beginning on the construction of the jetty where the submarine pens were built. The other above, is from a print dated 1801, and depicts the curious ‘‘marine villa“ of the eccentric John Smith, father of Admiral Sir Sydney Smith. Built in 1791 it was called Smith’s Folly. The series of buildings extended up to the cliff face where there were rooms hewn out of the chalk with chapel-like windows. Between is a zig-zag path up the cliff.